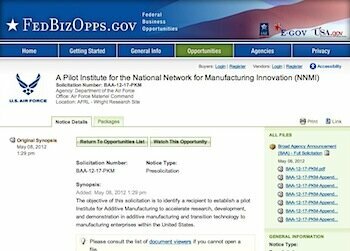 The solicitation for the Pilot Institute for the National Network for Manufacturing Innovation (NNMI). CLICK TO OPEN. Well, what do you know! The military has finally embarked on a project that may actually reduce their costs. The Pentagon just announced that they are offering up to $60 million for a new 3D printing institute, with the ultimate goal of cheaper and faster manufacturing of defense and aerospace parts. The new Additive Manufacturing Innovation institute has chosen 3D printing (additive manufacturing) as the first of up to 16 centers in the United States that will be dedicated to U.S. manufacturing innovation. This is part of the National Network for Manufacturing Innovation that President Obama announced on March 9, 2012. The Pentagon is soliciting universities and nonprofit organizations to launch the pilot program, as described in this document. And they are moving fast; A “proposer’s day” will be held on May 16, and proposals are due on June 14. $18.8 million of the $60 million is expected to be spent in 2012. That’s fast by any measure, especially for the government. Development of open architecture additive manufacturing processes that have flexibility in starting raw materials and processing conditions and that can utilize open-architecture machine- control software that can be customized for specific applications. Fabrication of novel hybrid materials at relevant scale with multifunctional properties, such as tailored stiffness, electrical conductivity, and cooling passages, including the potential use of direct write and deposition processes. Incorporation of in-situ metrology and process controls to measure quality and performance attributes. Improved deposition rates, manufacturing throughput, and process reliability. Deposition methods for improved surface finish, corrosion resistance, or wear resistance. Advanced manufacturing enterprise methodologies for enabling rapid design and functional fabrication of current and future DOD platforms through integration of digital designs with reverse engineering techniques, using computational tools and mechanisms. Fabrication methods with lower energy-intensity. Advanced methods to rapidly and affordably qualify additive manufacturing processes. Overall, the military wants to utilize 3D printing for the same reasons that businesses do: to save money while producing products after — in this case, weapon and related technology. And, in addition to the monetary benefits, there is the ability to allow personnel on the battlefield and forward bases to be able to print out parts and eventually complete, ready-to-use items without having to wait for delivery. I’m sure one or both of the big 3D printer companies, 3D Systems and Stratsys (including Objet) are going to be getting some government contracts soon.